Is this meat really right out of the wild? The concept of wild food is one I always find interesting for, as the old joke goes, “waiter is this meat really wild?” answer “Yes sir, it was absolutely furious when we shot it”. You can stop cringing now - that is the only attempt at a joke this week. So this week’s recipe is all about venison. I’m using the back strap as, for the new convert to this wonderful unadulterated lean meat, it is the easiest to cook well and needs the least preparation. Like all meat, venison needs to be well hung (and no that’s not another joke). 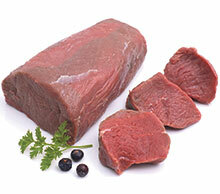 In the case of venison the hanging should be at least a week to make the meat flavoursome and soft. Proper hanging makes venison one of the best meats to eat, while insufficient hanging can put people off venison for life. Venison is one of those rich, gamey flavours that can handle a bit of creativity in the accompanying sauce. It works well with berry fruits or in this case, high quality chocolate. The idea is to add just enough chocolate to the sauce for you to be able to smell it without really tasting it; after all we do eat with all of our senses. When ready to serve, reheat sauce, add chocolate pistules and allow to melt slowly. venison. Try the 2009 Peacock Sky from Waiheke Island, probably the best region in New Zealand for Cabernet Sauvignon.